This entry was posted on March 23, 2013 at 6:51 pm and is filed under Bible, Federal Reserve, Government, Internet, Liberty, Media, Ron Paul. You can follow any responses to this entry through the RSS 2.0 feed. Both comments and pings are currently closed. 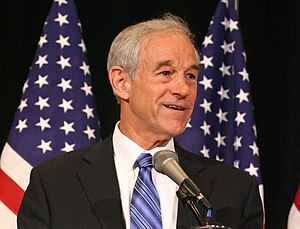 It occured to me that what the ronpaul.com web site owners wanted to get out of this was money. They say they want compensation for their time and effort in support, but Lew Rockwell says it appears they never gave the Ron Paul campaign anything from the money they were collecting from sales, as promised on the web site. If that’s true it’s fraud, no matter what good reason they may have had. But why are they demanding such an outrageous price? They claim their demands are even reasonable. Oh yeah? They say their mailing list is worth MILLIONS of dollars to Ron Paul. But Ron Paul is making no claim to it. Anybody who knows domain names can scoff & laugh out loud at the free offer of the dot-org name. Yeah. Like telling a bum you can’t give him food from your fully-stacked cupboard but if he wants it you’ll give him the weed cuttings from the yard. Like telling the divorcing wife you’ll keep the mansion, she gets the cook shack in back, you’ll keep the Audi and she can have the push cart. They just want compensation for snatching it up first. If it were a genuine homesteading case, it would be a legitimate claim in my opinion. But the domain name rules and structure are NOT physical real estate. Kinsella has said that himself. I work in IT (software engineer) and have thought about the Internet from a libertarian perspective for a long long time. In a true free market world, private enterprise would have found a way for us to access Ron Paul’s web site, as Ron Paul’s. Of this I am solidly convinced. It would have eventually become easy, like Apple’s user-friendly offerings made devices easier to use and carry. We would not have a government-mandated method to force a DNS monopoly like this. There would have been no dispute possible because quick innovators like the whiners who have profited from ronpaul.com (no harm in that) would have had to find another way to address themselves.